Is it just me, or is it impossible to open a newspaper these days without reading about Chipotle? I know they’ve had a few setbacks lately — there was that whole executive excessive salary issue last week; and then last month when they decided to print inspirational quotes from the country’s literary lights on takeout bags and cups and didn’t include any Latino voices in there…well, that was not the best thing ever. But there’s no question they’re shaking things up a bit and challenging the status quo –I mean, think how crazy it is that your adobo-marinated chicken tacos come with a side of Malcolm Gladwell or George Saunders reading? And how about that whole “Farmed and Dangerous” series they did for Hulu earlier this year — the four-part mini series eviscerating industrial agriculture? (“It’s not about product integration it’s about values integration,” said the campaign’s producer.) It’s also no small thing that whenever we finish a soccer game out in Jersey or Long Island, the first thing my kids ask me to do from shotgun is launch my chipotle app and find the closest location, so we can celebrate their victories (or soothe their defeats) with a big-a$$ burrito bowl. In other words, I’m willing to give Chipotle a pass on their most recent troubles. I’m also crossing my fingers that no one posts a link in the comment field telling me they’re hiring two-year-olds in Bangladesh to do their sustainable farming or something like that. OK now that all the wonky stuff is out of the way — here’s the real point of this post: Have any of you thought about a Chipotle-catered birthday party for your kids? Because until last month, it never occurred to me, even though all I do is whine about never finding any takeout party food that is as big a crowd-pleaser as pizza. (Remember that dark moment in birthday history when I served California rolls at Abby’s Japanese-themed party? And one of the poor little unsuspecting seven-year-olds actually cried?) Anyway, Phoebe went to a 12th birthday party a few weeks ago where all the celebrants got to make their own burritos, courtesy of the local Chipotle. I thought that was such cool idea. There was shredded pork, chicken, and then beans for the vegetarians. And of course, all the toppings and the cilantro-spiked rice that we love so much in our house and replicate often, along with the rest of it. The order comes with sternos, trays, serving utensils, too. It’s totally my new party move. i love burritos, this would make for such a fun party! just make sure you get extra chips and guac. that stuff is necessary. I think that’s brilliant, and totally in line with the low key parties I tend to love to throw. I love to cook day to day, and love to make desserts, but I can get stressed cooking for so many, especially if they aren’t family. That is an awesome idea! I know they cater, but I wouldn’t think to do it for a bday party! OOOH I had no idea. I know a soon to be 46 year old birthday guy who’d like this, too. Fantastic idea! I had no idea they catered (and don’t think they do in Canada) but think it’s a pretty fabulous way to serve food to a crowd of kids (or anyone for that matter). I absolutely love this idea (because I absolutely love Chipotle). I will definitely be stealing it for all parties, not just birthdays. While I would love to see more Cormac McCarthy passages on my diet Coke, the photo you posted was, in fact, a joke. Chipotle’s literary excursion does not include a few paragraphs from “All The Pretty Horses” about John Grady stabbing a guy to death in a Mexican prison. Oh yikes @Lex — thanks for pointing that out. Wowowwow. All fixed. lurrvve!! i am so doing this for my 14 yr old’s graduation from middle school. thank you…you just saved me!! That is an awesome idea! I am always stuck doing pizza and wings for my son’s bday. This would be something different. That’s some party! I looked into it for a recent family event. Unfortunately the minimum for make your own burritos was 20 people and it was $$$!!! I would totally be done for a Chipotle catered party!! This really, really reads like a sponsored post. And, yet, I don’t see any indication that it is… which both bugs me and sends me searching for DALS’ advertising policy. I have zero objections to people benefiting from blogging – in fact, I think it’s important to compensate individuals for putting good things out into the world – but also think it’s important to be upfront about it or trust is undermined. My two cents, which I’m sure will be torn apart in the comments that follow. Just know that it comes from a good place. I’ve followed DALS for years now, am fond of your site and cook from it often. Also want to acknowledge that I might be wrong. Happens every so often…. @bergamot: I’ve just interrupted dinner making (california-style turkey burgers on grill http://ow.ly/xy5a6) to respond to this comment because I want you (and all DALS readers) to know IMMEDIATELY that of course NO NO NO NO NO NO NO this is not a sponsored post. It’s actually against FCC regulations (or the law or something) to write a sponsored post without letting your readers know. You do bring up a good point which is that I should probably have some sort of advertising policy somewhere on the site. I will do that after the turkey burgers are consumed. In short, thank you for bringing this up: You can trust me. Now go plan your Chipotle burrito bar. Well, now I just feel bad that I’ve interrupted your family dinner time! Thanks Jenny. I’m reassured. Off to tend to my own little ones, who are actually on a flu-induced diet of toast and bananas at the moment. They’ll love burritos when they can have them again, I’m sure. Heck, they catered our 150 person wedding just fine too! Best. Weddingfood. Ever. We just went to a 4yo birthday party where this was the food. The parents were so excited! It was awesome. My (baby) brother graduated from high school last week. 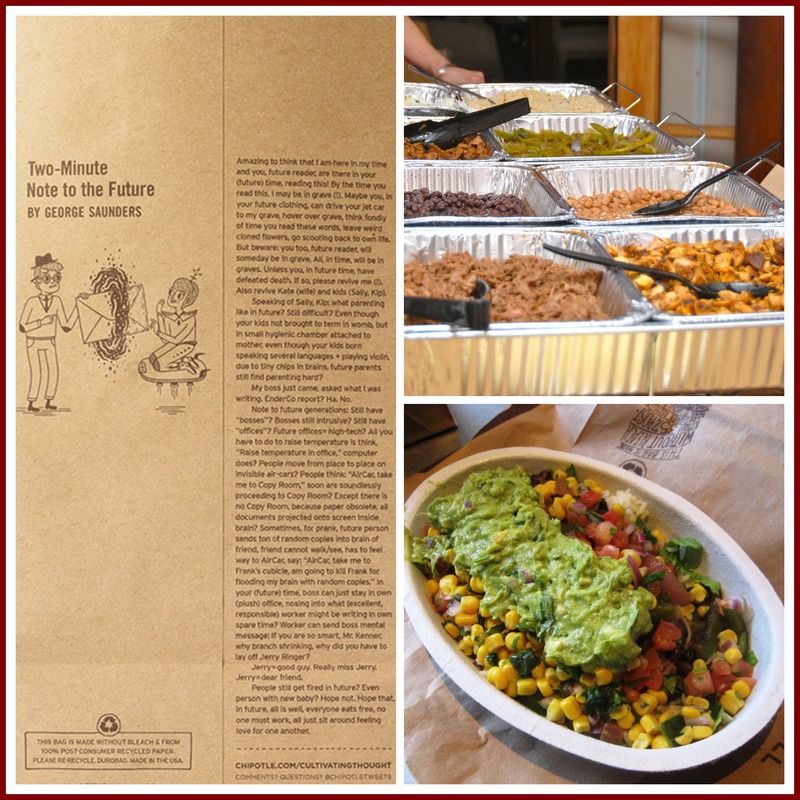 His graduation dinner was catered by…Chipotle. I order Chipotle catering for work from time to time and it’s always a hit. I just wish they delivered! Now *that* would be amazing. Not available in NYC at this time!?! Sad trombones. I agree that this is a great idea…and a huge thank you for making this new mama feel in-the-know, because I thought of this for my soon to be one-year-old’s birthday party this week. But I was shocked to find out that the 2 meat burrito bowl package is $12 per person! Maybe it’s just me and my over-inviting tendencies, but that seems pretty expensive for a kid’s party…no?